In the four Sunday poll releases from four states there was not a whole lot at which to look. Of the four states, only one -- Florida -- is even remotely competitive. The other three are all in the Strong category in one direction or another and one -- Idaho -- is like Hawaii and Rhode Island were a week ago, but in the opposite direction: an afterthought in the presidential race. But hey, it is always nice to have data to back that up. Just yesterday FHQ was commenting on the preponderance of +1 margins in Ohio polling. Before the first presidential debate that had been the case in Florida as well. Since that time, however, the margins have drifted in varying degrees toward Romney. The raw average of the eight post-debate polls in Florida is Romney +1.875 with the median being Romney +2.5. The PPP survey above falls below both, post-debate, and while the data point may feel like something from the period before the October 3 debate, the poll-over-poll shift from the last PPP survey was +3 toward the former Massachusetts governor. And that is pretty consistent with the debate shift overall. Up north of Florida in the Peach state, things are pretty settled. The Romney +8 from the AJC is certainly more in line with the state of the race for Georgia's 16 electoral votes than the last poll from Insider Advantage (Romney +21). 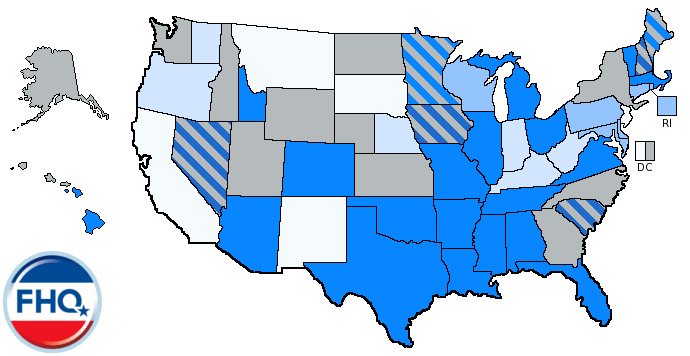 This one nailed Romney's share of support; at least as compared to the FHQ weighted average for the governor. But it was slightly bullish on Obama's share of support relative to the FHQ measure. A strong red state is a strong red state, though. 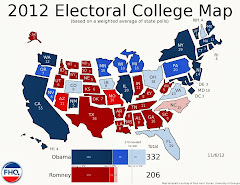 Speaking of strong red states, the Gem state looks like it is safely in the Romney column. The only linger question may be whether Obama can best the 28% Al Gore garnered in Idaho in 2000. Obama is threatening. New Mexico in 2008 and 2012 just was not/has not been the toss up state it was in 2000 and 2004. It is perhaps strange to link the two, but New Mexico is to Mitt Romney what Georgia is to Barack Obama. Both are strong states for their respective candidates and really haven't shown any indication in the 2012 polls of the contrary. On a slightly different note, when we compare this poll from the Albuquerque Journal to the September poll the paper sponsored, Obama actually gained five points relative to Romney. Most of that change was between the undecideds and Obama. Former New Mexico governor, Gary Johnson, like Romney stayed pretty stable, only losing a point since the last poll. Typically one toss up state poll and three strong state polls together are not a recipe for change, and that is the case with the polls released today. 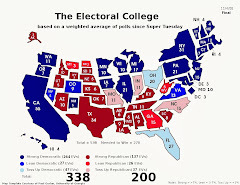 The map remained unaltered as did the Electoral College Spectrum. Somewhat surprisingly for sporadically surveyed strong states, there was no shuffling on the Spectrum. Georgia and New Mexico held their lines and Idaho didn't really have anywhere to go. Even a +36 couldn't push the average past Wyoming or Utah. Florida, meanwhile, has dug into its spot on the Obama side of North Carolina in the order, but it is tracking toward the Romney side of the partisan line. The Watch List did not witness too much change either. Georgia inched right up to the line, but did not push on to the list. Statistically, Oregon made the cut even without a new poll. The average there eased just north of the 8% mark and is on the list. The Beaver state is one of those, like, say, Minnesota, where it might be nice to have some post-debate data. Things have likely closed some there as elsewhere. That said, Florida, Nevada, New Hampshire and Ohio are still the half of this list most worth watching. 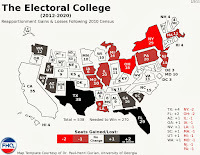 How and if they shift has implications for the ultimate electoral college calculus if not breakdown on election night.